This post contains affiliate links, which means that if you click on one of the product links below, Wanderlust and Wellness may receive compensation. I’m pretty convinced that guacamole runs through my veins. Like, I love it more than I can describe here. Do you love it as much as I do? If so, we could be guacamole besties! There’s a local Mexican restaurant that we visit frequently that has the most amazing food and their guacamole always wows me. They change their guacamole recipes seasonally, so you never know what you’re going to get. I like to call it fancy guacamole, which almost became the title of this recipe, but I figured that wasn’t quite specific enough. 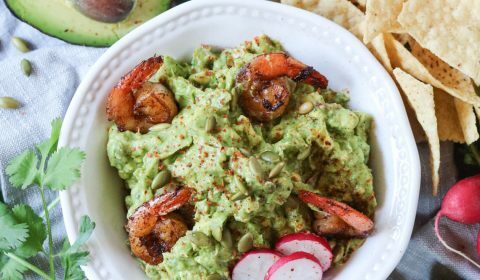 Needless to say, their mastery of guacamole variations inspired me to create this chipotle shrimp guacamole for you! 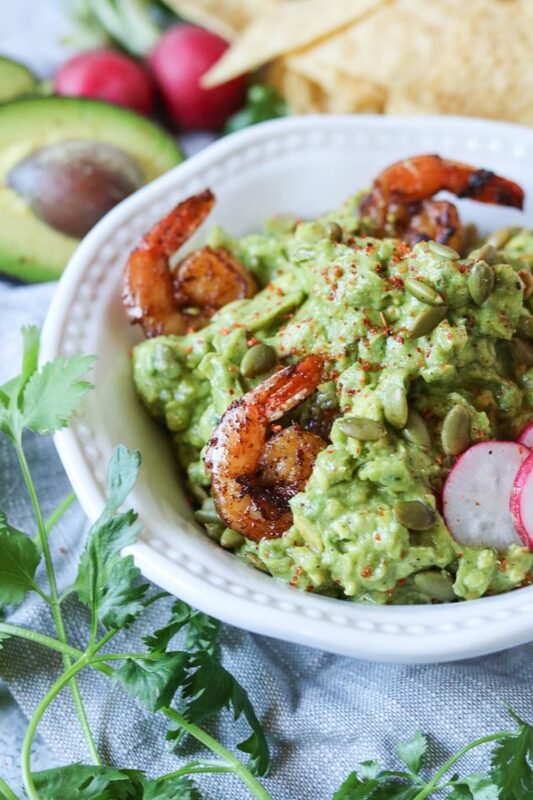 This chipotle shrimp guacamole has the usual fresh guacamole ingredients like avocado, cilantro, lime juice, and garlic, with the addition of radishes, pumpkin seeds, and of course the spicy chipotle shrimp. Of course, I topped it off with Tajin because, well, it’s just so good with everything! If you can’t find Tajín Clásico Seasoning in your local grocer, you can always order it on Amazon and have it shipped ASAP. 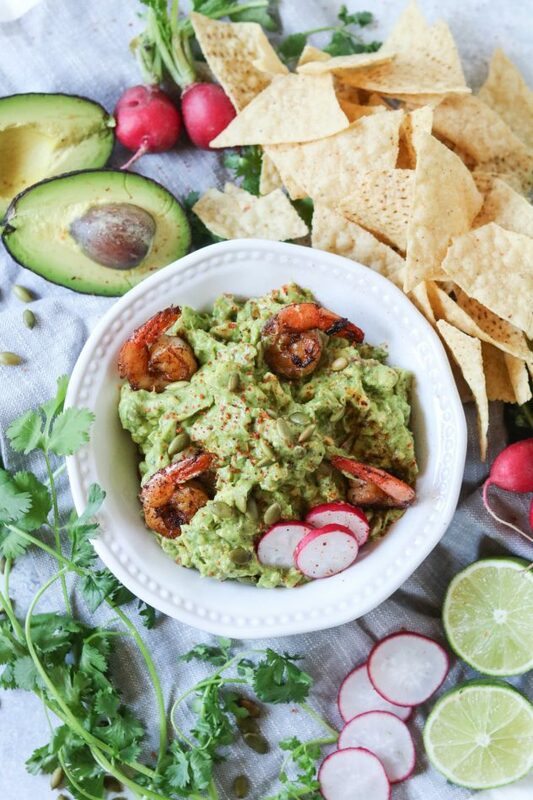 The chipotle shrimp gives this guacamole an additional oomph of both spice and flavor. I’m also starting to love radishes. I never really ate them much but they’re quickly becoming one of my favorite summer ingredients to add to recipes. They’re fresh, crisp, and give a little bit of a kick. It’s funny how our taste buds change over time. 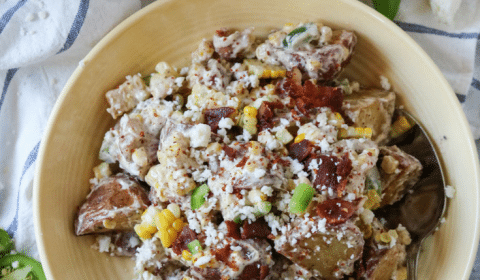 This recipe is another teenager approved recipe, even the ones who used to turn their nose up a guacamole. Blasphemous, right?!? I mean, who doesn’t like guacamole?? 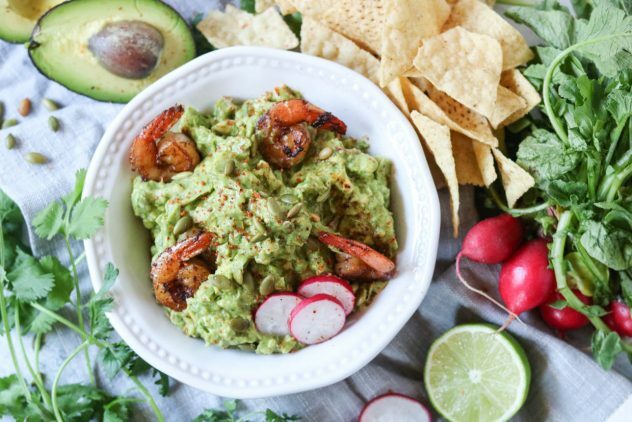 Jazz up traditional guacamole with this chipotle shrimp guacamole. In a large skillet, heat up the avocado oil over medium heat. Remove any remaining shells or tails from the precooked, thawed shrimp. Add the shrimp to the pan, season with chipotle powder. Cook for about 3-5 minutes on each side. Remove from pan and let cool. Using a knife, slice the avocados in half, and remove the pit. Using a spoon, scoop out the avocado and add to a medium-sized bowl. Mash the avocado until the consistency is smooth with just a few small chunks. Add the lime juice, minced garlic, chopped radishes, chopped cilantro, salt, pepper, and 2 tbsps. of pumpkin seeds. Add in about half the cooked shrimp and mix to combine. Transfer the guacamole mixture to a serving bowl. Top with the remaining cooked shrimp, the remaining tbsp. of pumpkin seeds, then season with Tajin.